I bought this beautiful linen fabric in Tasmania last time I was there, I also bought the hessian straps from a fave little shop called The Maker in Salamanca. Finally I have put this together and I love it, might have to make a few more of these, the pattern (from The LongThread) was easy and well designed. It is the perfect Tote ! I have been very slack with blog updates of late however I do have a great excuse. I have had my head in my sewing machine. Busy with 5 quilts on the go, one for my Dad, one for the School Fete, one for Lucy, a Liberty & Linen one and a Star Quilt 'just for technique'. 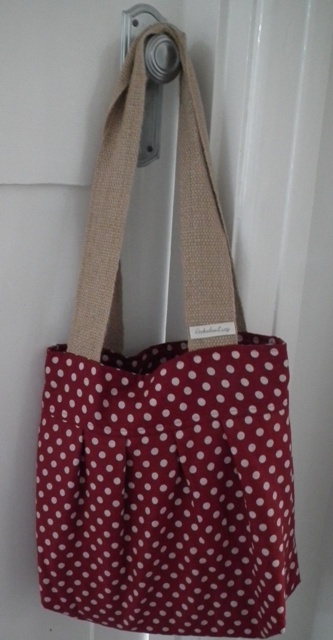 I am also branching out and have made a cute bag and a hobby bag. A few weeks ago I had a weekend away with my best and we sewed our selves silly ! I am slightly addicted right now and would rather be sewing than working. My niece turned 3 yesterday and she loves dolls. 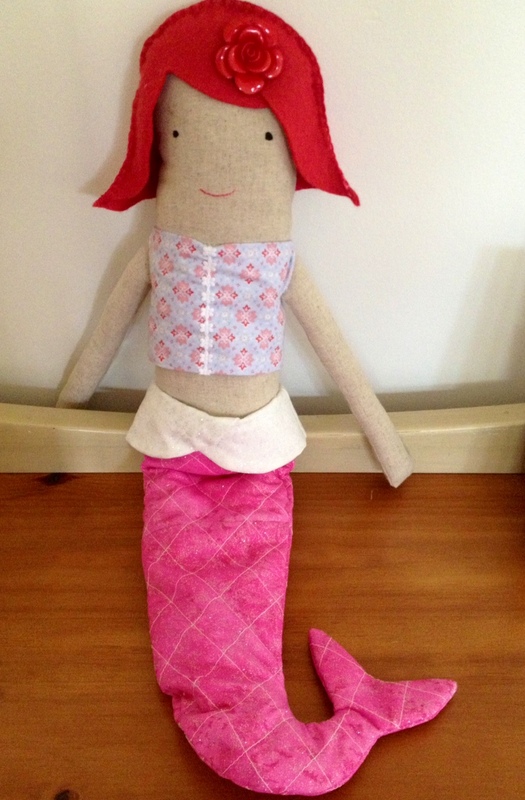 I found this gorgeous pattern online for a mermaid on Etsy from a little shop called Tuesday Mourning and made her a mermaid. Her tail is quilted and hair is felt. 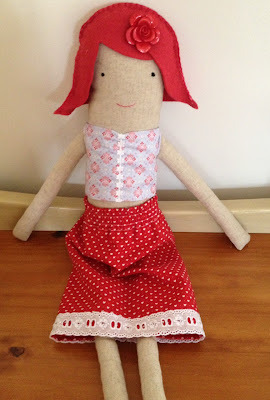 I really enjoyed making her and will attempt another one for Lucy. Big progress on painting. Hubby has been very busy after work every night and most of the weekend. The balustrading has required 4 coats. 2 undercoat and then two in the stinky enamel. The result is wonderful and the back half of our house looks so much bigger, fresher, cleaner and more welcoming. No more mis-matched timber. We are still yet to roll the walls (Antique White) and then there are doors, skirting boards and the stairs to sand and stain. Still a lot more to do but so far we are really happy with it. I woke up early on Sunday morning and decided that if we were going to really get our painting job underway we would need some fuel to renovate. Lucy and I whipped up some banana and walnut muffins and my Mum's Museli Slice. I have to say that they both seem to disappear I this house very quickly. The latest inside job we are tackling is the timber work at the back of the house. 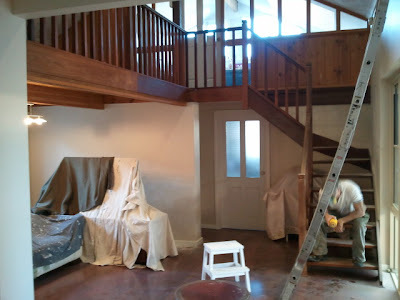 The stairs lead up to a mezzanine floor and what is now Lucy's play room. We hope to one day convert it all into a really fantastic area for Lucy to sleep, play and eventually.. study. First job, sand the entire lot, fill the cracks with timber putty and a heap of no more gaps. Then, undercoat the lot and paint the whole lot white. I will take lots more photos along the way as this is a mammoth task and will take a few weeks to complete. As my hubby said last night while I was painting and watching Revenge... we can just plug away at it. Might need a truckload of Museli Slice. I live in Perth and would rather be sewing than working. Lucy my daughter loves to sew too. I like to make anything with gorgeous fabrics.